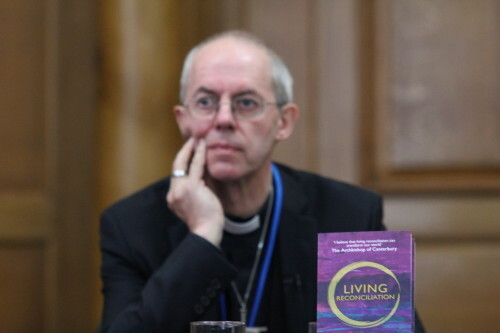 Living Reconciliation is a book ‘that takes away from us the excuses that we use for not engaging with our differences’ said the Archbishop of Canterbury at a book launch at the General Synod of the Church of England. Archbishop Justin Welby talked about agreeing to write the foreword to the book before he had read it because of the respect he had for the authors, Phil Groves and Angharad Parry Jones. At first he just skimmed through, but when he found the time to read it he was delighted to have agreed to be associated with it. ‘It is an extremely good book’ he repeatedly told the audience of synod members and invited guests. Genuine reconciliation is incredibly rare, and the Archbishop emphasised that it is only truly seen in the reconciliation between God and humanity through Christ. This is the starting point of the book; a book that according to the Archbishop that calls us not to hold back. He said that we avoid the hard journey. ‘It’s not reconciliation, it’s learning more or less to scrape along with each other, rather than to love each other and be reconciled to each other’ he said. Following a series of questions Archbishop Justin reflected on the issues of power that feature on Chapter 4. He commented that in so many places of conflict all feel they are powerless facing an over whelming opponent. He also faced questions on the shared conversation process in the Church of England and spoke of the unique issues of power that faced those seeking to create safe space. He offered no solutions, but demonstrated an awareness of the issues that will face the Church of England over the coming months.